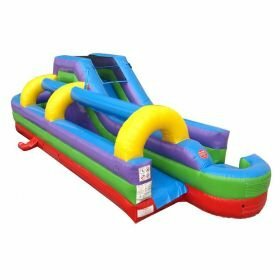 Inflatable panel water slide has one of the easiest set of steps to climb. It will lead to a nice slide that has a steep slide drop. At the bottom of the water slide splash pad. Your option to be able to choose your theme is perfect for any party rental. (Max weight capacity is 200lbs) per person. Designed for ages 3 to 10!